Our most recent organic produce delivery included not one, but two heads of cabbage. That put cabbage prominently on our home menu. As you may remember from a recent recipe for Caraway Chicken Salad, I love cabbage, but it doesn’t necessarily rate so high with the rest of my family. My challenge, then, was to be able to serve it…and serve it…and serve it without anyone getting tired of eating it over and over. The secret is in the spices. 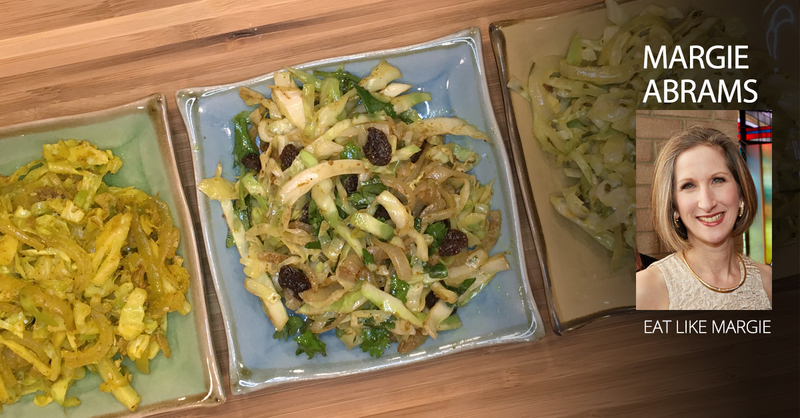 I have a lot of other ways that I’ve spice cooked cabbage, but here are three that I (and my family and guests) particularly love. Besides the flavorings, there only three ingredients to prep (two if you buy jarred or frozen garlic…one if you buy shredded cabbage). It’s so easy…and fast to cook, too! Warm up sauté pan on medium heat (4 of 10). Add spices of choice (see below), and continue cooking to desired doneness—I prefer the cabbage on the firm side so it’s pretty much done once I mix in the spices, but you may prefer it softer. Amounts here are approximate—I don’t measure when I cook this. I just shake over the pan or into my hand. I also find that flavor intensity is reliant on personal preference. So you may want to start lower than what’s suggested here and add if you want more. Note: This curry blend tastes even better if you cook the cabbage with coconut oil instead of olive oil. Try it raw: These blends are equally delicious raw. In fact, cabbage is one of those superfoods that it’s best to eat both raw and cooked. If enjoying fresh, add some extra-virgin olive oil, yogurt or mayonnaise…and use either sweet onion or red onion, which are both delicious raw, rather than conventional yellow onions, which can be too strong. And, of course, feel free to add to the mix—carrots, celery, apple, tomato, cucumber, etc. Add a protein: Make this an all-in-one meal by mixing in a healthy protein. I’ve used leftover chicken or turkey, chickpeas and fish (either leftovers or something from a can—when doing this with fish, I always eat it as a cold salad). If doing this for a hot preparation, you may want to add a bit of liquid—e.g. some chicken broth or, for the curry blend, unsweetened coconut milk—to give you a bit of gravy. Serve over your favorite whole grain of choice.